Nasal and sinus cultures are used to identify the organism causing the infection. Cultures are simple, quick and safe. 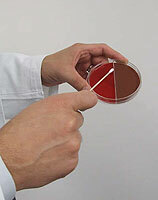 Cultures are frequently used when infections treated with the appropriate antibiotics have not completely resolved. Nasal and sinus cultures are becoming more important with the emergence of bacteria resistant to common antibiotics. Patients at the Los Angeles Sinus Institute have access to our in-house microbiology laboratory overseen by our experienced microbiologist. The cultures obtained allow Dr. Zadeh to determine the source of the patient’s nasal and sinus infection. A culture can be obtained by simply swabbing the discharge from the sinuses. This can be done with direct visualization or endoscopically. The procedure is pain free and takes seconds. Culture results return in about 2-3 days and include the type of bacteria and a list of antibiotics that will effectively treat the infection. All culture specimens are also tested for fungus. For more information regarding cultures, please contact Dr. Zadeh at Los Angeles Sinus Institute.